Astigmatism is one of the most common - and misunderstood - vision problems in the world. First and foremost, it is “astigmatism”, not “stigmatism.” Similar to both nearsightedness and farsightedness, astigmatism is a refractive problem with the eye, not a disease or health problem. Individuals who have astigmatism cannot focus on the light as the eye should. When you have astigmatism, light does not come to a single focus on the retina as is necessary to create clear vision. In reality, there are multiple focus points, either in front of the retina, behind the retina, or both. Refraction is the bending of light as it passes through one object to another, and then into the eye. We are able to see clearly when the light rays are refracted (or bent) as they pass through the cornea and lens. The retina then focuses the light and converts it into messages sent through the optic nerve straight to the brain. The brain then interprets these messages, turning them into the images we see. Individuals with astigmatism have a cornea that is curved more like a football than a basketball, creating a slightly distorted image. Depending on the severity of the condition, it can cause images to appear blurry, stretched out, or just plain “off.” Both children and adults are at risk of developing astigmatism, which is why it is so important to have regular eye exams. Some people don’t even know they have astigmatism until they go to the eye doctor. Early detection is key here, as it will allow your eye doctor to monitor the development of the eyes and how they react to astigmatism. 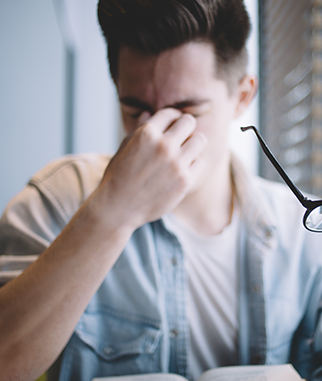 Corrective contact lenses and eyeglasses have proven to be quite useful in treating those with a slight astigmatism, but refractive surgery may be necessary for some. It is important to keep in mind that it is quite possible to have a mild astigmatism and not realize it. This is especially the case for children who are unaware of what their vision is supposed to look like. Be sure and have a comprehensive dilated eye exam on an annual basis in order to make sure you are seeing to the best of your ability. If you notice any of the above symptoms on a regular basis, there’s a good chance you have astigmatism. Please contact the First Eye Care location closest to you today to schedule a comprehensive eye exam with one of our doctors.